Even the sign is bright and happy! The “Asian” part of the Drag is the area near MLK Jr. Blvd. with phở, bubble tea, bánh mì sandwiches, and Asian stir fries. One of the popular favorites to visit over there is CoCo’s Café and it’s one of the two main places on the Drag to get bubble tea. 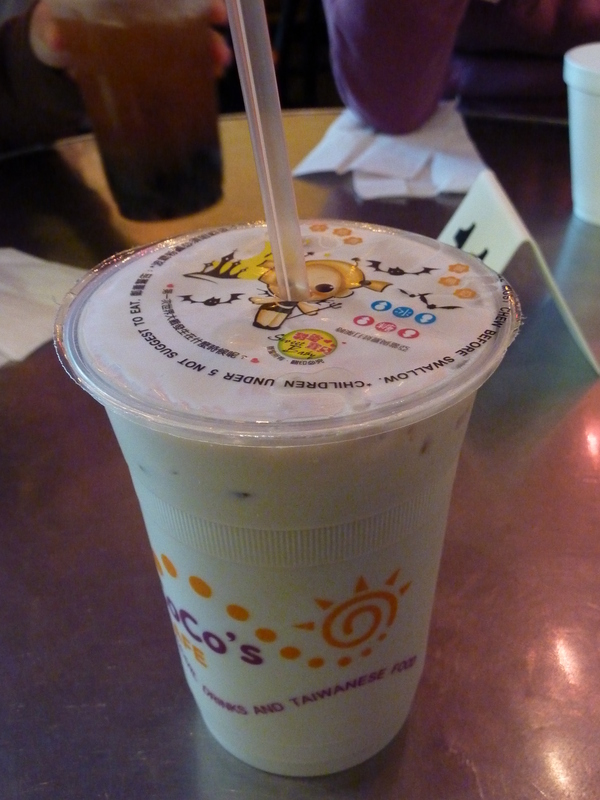 Between the two, CoCo’s Café bubble teas tend to be sweeter so be aware of this. I see the pictures, but what do they match up with? Check out the next pic. CoCo’s Café is the more modern, Asian chain restaurant between it and Tap House with lots of seating, a brighter atmosphere, and cute Asian items in the back for looking at. 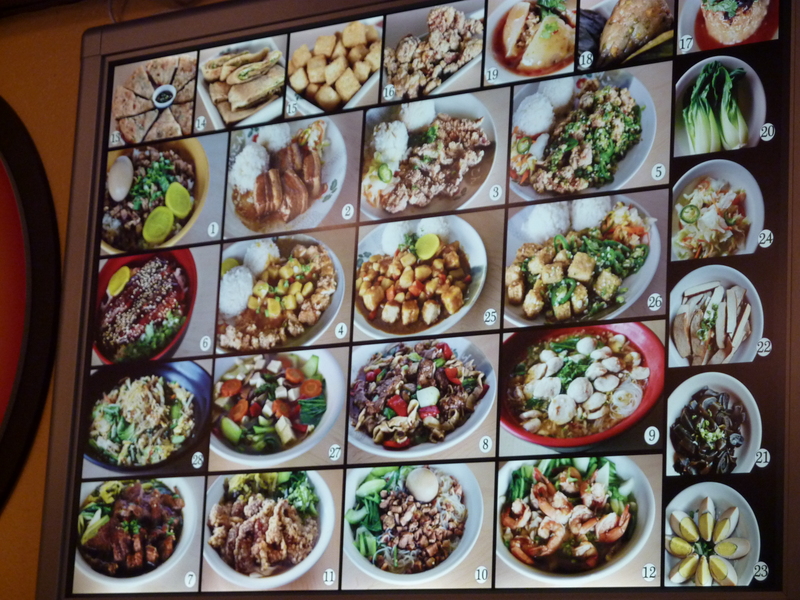 The menu is quite inviting, especially since its update from my freshman year to a huge picture menu next to the regular menu. Popular favorites include the peppercorn chicken. I personally recommend the green onion pie and the vegetable vermicelli. Here's the menu! Prices have gone up since I took this picture. Looking around the place, it is a rather bright and colorful store. The front of the store is windows and there are track lights above the counter to order that also help highlight the menu. You can order bubble tea, Asian food, or even shaved ice that is a little-known secret of the place. You can get all non-food related needs at the back of the store along with their parking. Utensils are available in the back along with free soup and water. They have also installed a curio case full of Asian products like phone chains and cute animal figures that entice you to buy while you wait hungrily for your food. Now, onto the food! The vegetable vermicelli I first saw when my friend got it. It is kind of like sly-foon if you’ve ever had that. 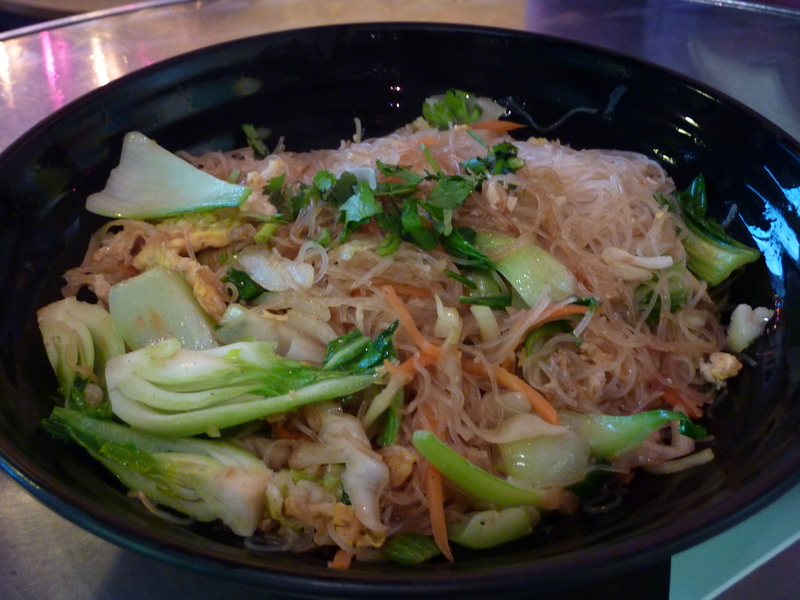 It is basically clear vermicelli noodles stir fried with veggies and egg and quite delicious. It is a little on the salty side, but it’s not because it tastes salty. It is more a need to drink water after eating it. It’s quite a big portion size and it’s lasted for two meals for small appetites and just enough for a big appetite. I especially like to order this when I feel like noodles and veggies since there are a lot in this dish such as bok choy and gai lon. I’m sorry I don’t have a picture of the green onion pie, but you can kind of see it in the visual menu at the top left corner. It is quite delicious and if you get the full size, it is like two onion pies on top of each other. Basically, it is an Asian pancake where a rice or flour-based dough is mixed with green onions and fried into slices of crispy deliciousness. The green onions give extra flavor that does not overwhelm to the fried dough and tastes great with the dipping sauce of soy sauce, vinegar, and green onions. It’s a bit oily, but definitely recommended. 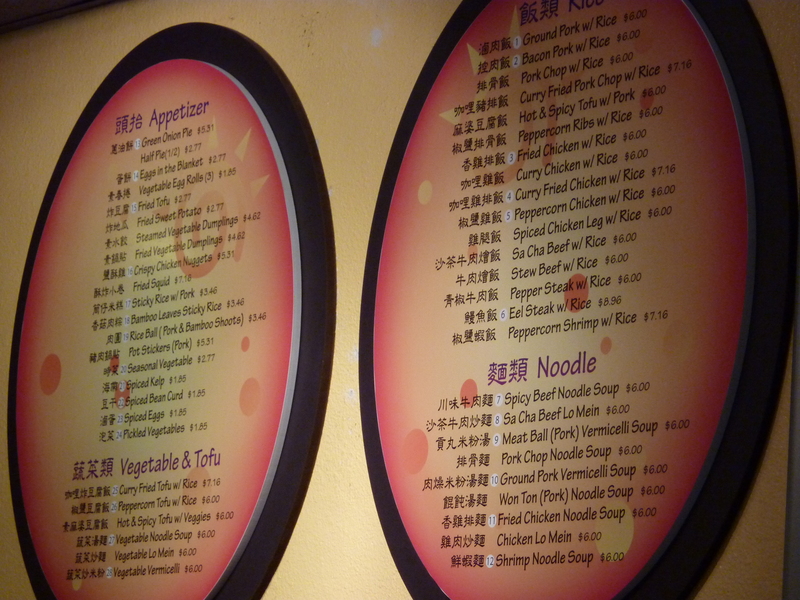 Actually, all the appetizers are recommended as they are a fair price that go well with the bubble teas. For some reason, I like to put the straws through the picture's mouths. Which brings me to bubble tea. The bubble tea is pretty good, quite large in variety and a nice size. It costs a little extra for bubbles/tapioca pearls FYI. I always seem to order almond milk teas at the bubble tea places so in terms of the almond tea at CoCo’s Café, it is quite delicious. There is certainly enough milk in the tea and not a very fake-tasting almond extract flavor. However, I do find CoCo’s Café bubble tea to be on the sweet side and it even gives me a headache sometimes due to its sweetness. 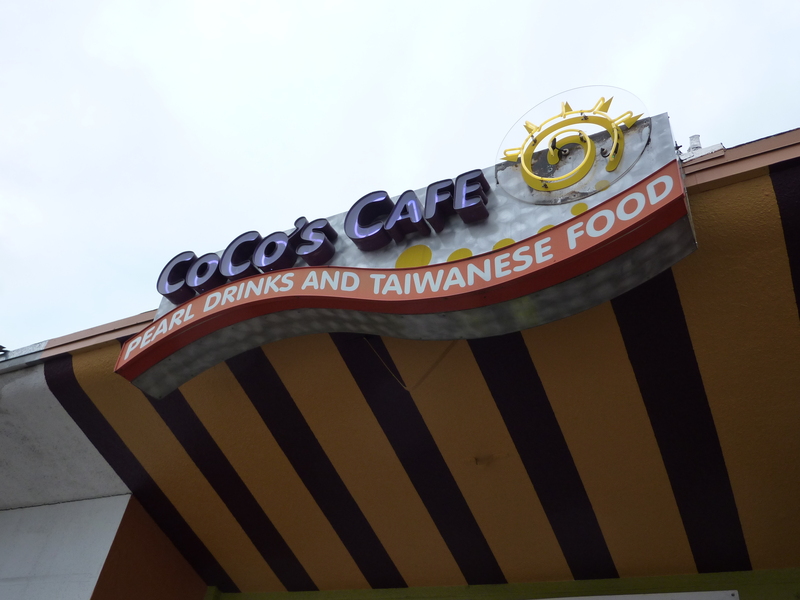 Overall, CoCo’s Café is a great place on the Drag to get some pretty good Asian food and bubble tea at a reasonable price. It is open on Sundays and holidays and actually has parking, which is good if you have friends from off-campus visiting. Rating: 😛 😛 😛 😛 for fair prices, sweet bubble tea, and a bright happy atmosphere. Yes, I Will Marry You Ken’s Doughnuts, Love B. REVIEW: Sno Beach: What’s Your Favorite Flavor? Now where was that post again? © quotid of Austin: Keeping It Foodie, 2010-2011. Unauthorized use and/or duplication of this material and/or photographs without express and written permission from this blog’s author and owner is strictly prohibited. Excerpts and links may be used, provided that full and clear credit is given to quotid and Austin: Keeping It Foodie with appropriate and specific direction to the original content. If there are any questions, please contact the author through the means given in the 'About' page.